Every season there are one or two episodes of Doctor Who which really stands out, often winning the Hugo and Nebula awards. Most of these episodes have been written by Stephen Moffat, including The Girl in the Fireplace and Blink. Those of us watching (or downloading) the shows from the BBC have seen this year’s presentation from Stephen Moffat, a two-part story consisting of Silence in the Library and Forest of the Dead. This portion of SciFi Friday will contain many spoilers for those who are watching on the SciFi Channel which is a few episodes behind. The two-parter essentially had three different aspects to it. The Doctor is called to a planet-sized Library. The story dealing with Vashta Nerada was the weakest portion. The Vashta Nerada are microscopic creatures which live in the shadows, and which are responsible for the fear of the dark which has arisen in many civilizations. They can devour an organism in seconds, making it necessary for all the people who had been in The Library to be saved. This served as a menace to drive the story but ultimately once the other two aspects of the story reached their conclusion this was resolved too easily to be satisfactory, with The Doctor convincing the Vashta Nerada to allow one day to get the humans away. While I was dissatisfied with the conclusion of the story related to the Vashta Nerada, the nature of the menace was far superior to that of the previous episode. In The Unicorn and the Wasp The Doctor met Agatha Christie. Much of the episode had the feel of an Agatha Christie mystery, but having the menace turn out to be an alien who appeared like a giant wasp felt incongruous with the feel of the show. A more subtle menace such as the Vashta Nerada, which were either invisible or seen as shadows, would have better suited the feel of that episode. One technique used in this story was to give the viewers answers which turned out to be different from what might be anticipated, but were consistent with the story. The Vashta Nerada were creatures of the forest, and in this story the forest turned out to be the paper of The Library. Even more important to the overall plot was the meaning of “saved.” Throughout the story we were told of people being “saved” with no evidence of life being found. Ultimately we find that the people literally were saved by the computer to its hard drive, with portions of the story taking place within an artificial reality created by the computer. Having this extra layer turned what would have been a mediocre story into an excellent one. The third aspect of the story was to have The Doctor meet someone who had already met him. One important aspect of some of Moffat’s stories is that time actually plays an important role. In most stories The Doctor might travel through time to reach the destination, but once he arrives time travel is generally not important to any individual story. In this story The Doctor meets archaeologist River Song (Alex Kingston, previously of ER) who summoned him for help. She had met The Doctor at a later point in his life and knew a lot about The Doctor and Donna. To The Doctor this was their first meeting. 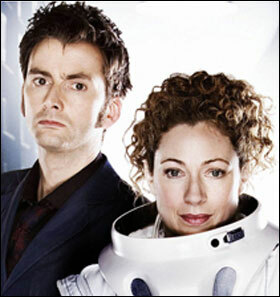 River convinced The Doctor to trust her by revealing that The Doctor had told her his real name. Since Doctor Who resumed a few seasons back the formula has been for there to be a story which gradually builds through the season with parts revealed gradually in individual episodes. There may also be trends developing more slowly over seasons. The Doctor’s name has been mentioned in episodes including The Girl in the Fireplace, The Shakespeare Code, and The Fires of Pompeii. With Moffat taking over as show runner when Russell T. Davies steps down, perhaps the themes used by Moffat will become even more prominent in future seasons. It will be interesting to see if we are actually shown the relationship between The Doctor and River as mentioned in this episode, with The Doctor knowing her ultimate fate (and how he saves her by transferring her intelligence to the computer after she appears to have died) from the moment he firsts meets her. Having The Doctor meet River in such a manner points out a flaw I’ve considered ever since the series revived. Since the original series there was a war in which the rest of the Timelords were killed. I’ve thought that it does not make sense to have a situation where The Doctor will never run into the Timelords when he (and other Timelords who left Gallifrey) are moving throughout time. Just as The Doctor will first meet River (by his time line) at the time of her death (in River’s time line), even though other Timelords have died (in The Doctors time line) he could still run into them at an earlier point in their lives before the time war. I have one additional complaint about what was generally an excellent story. Racing to prevent the completion of a computer’s self destruct sequence has been done way too many times. There is never any real suspense as there is always a second to two to spare before the self destruct sequence is completed. With another excellent story, despite some minor flaws, It appears the show will be in excellent hand when Stephen Moffat takes over as show runner. Besides his own work, there are rumors that he has convinced Neil Gaiman to write an episode in 2010. Next season we will have far less of Doctor Who while David Tennant is busy in Hamlet (along with Patrick Stewart). Instead of a regular season in 2009 there will be occasional special episode. 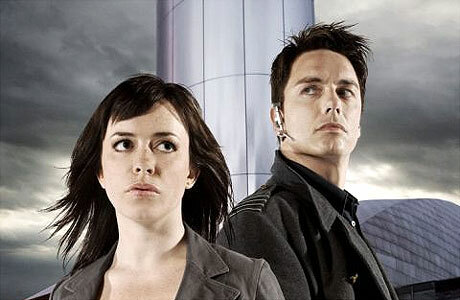 Now it also appears that we will also have very little of Torchwood. The BBC only plans five episodes, which will air in a single week. They will appear on BBC One, which probably means the show will also be watered down even more. After the deaths of two major characters there has been speculation that Martha Jones would return to Torchwood. Freema Agyeman will also be busy on another show. She has a role in another old BBC show from the 1970’s which is being revived, The Survivors. The show is about the survivors of a plague which wipes out most of the population. Captain Jack lived through much of earth’s history. The Doctor travels to any period and usually manages to fit in (although he wasn’t very popular in old England). Surviving in the past would be much more difficult for a modern American who happened to be transported back to Europe of 1000. This happened to be the topic of discussion at Marginal Revolution a few days ago. Being able to write, or even program, a blog would be a totally worthless skill. Most of what we know would also be pretty worthless back then, and discussing what we know could get us killed. If we managed to survive after coming to an area which isn’t too friendly to strangers without knowing the language or having appropriate clothing, we would have a tough time with the manual careers available at the time. Working in the church might be the best bet, but would also increase our risk of saying something which could result in execution. Then we’d have to worry about surviving the diseases of the time. Having a Tardis is definitely the only way to ever consider visiting the year 1000. Posted in Science Fiction, Television. Tags: David Tennant, Doctor Who, Forest of the Dead, Freema Agyeman, Hugo Awards, Martha Jones, Neil Gaiman, Patrick Stewart, Revolution, River Song, Russell T Davies, Science Fiction, Torchwood. RSS feed for comments on this post.. TrackBack URL.